In 2004, the magic of New Zealand called my name, so I packed up my life here and followed that call. At that time I had been practicing Hatha Yoga for a few years, and was eager to find a yoga retreat to immerse myself into. A series of synchronistic events lead me gracefully to Anahata Yoga Retreat. It was just as I imagined; the land was stunning, the gardens were abundant, the community was delightful, and there were daily classes in yoga and meditation. Yes! But what I wasn’t expecting to find was that this retreat center was infused with the teachings and tradition of Satyananda Yoga®. At the time I had no idea what that even meant, or how it would influence my life, but I felt at home within the practices. I quickly learned that this style of yoga goes way beyond the yoga mat. 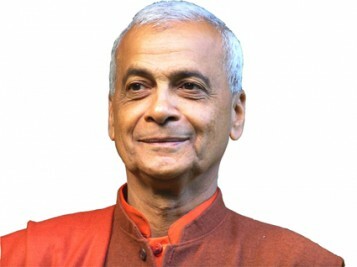 Swami Muktidharma is a modern day Yogi, spiritual mentor and world recognized inspirational speaker and has spent the last 40 years dedicating his life to the internationally renowned system of Satyananda Yoga®. As a young man Swami Muktidharma began his spiritual journey in Colombia. After being inspired by Yoga and Tantra Master “Paramahamsa Satyananda” he moved to India and spent 16 years living directly with him, receiving training and experience in the depths of yoga and tantra. His practical understanding of yoga is a result of this personal experience over many years. It is firmly grounded in tradition, supported by science and adapted to suit the needs of contemporary living. Integrating different aspects of Yoga, such as Hatha, Raja, Karma, Mantra, Kundalini and Bhakti Yoga, Satyananda Yoga® is a holistic system for positive personal transformation. Swami Muktidharma shares his wisdom and experience, as well as solid techniques of Yoga and Tantra while travelling throughout the world to inspire and uplift humanity, including two yearly visits to India, where he leads courses and in depth retreats. He has recorded 4 Meditation Cd’s and published insightful articles on various topics of yoga. He is the Yoga Acharya and co-founder of Anahata Yoga Retreat in New Zealand, where he is currently based, working therapeutically with people from around the globe and training residents in living a yogic lifestyle. He shares with humour and strength, touching the heart of many aspirants and inspiring them to expand to their full potential. 1. You lived with Swami Satyananda for 16 years. What is the most important teaching you received from him? Swami Satyananda mainly taught me by example. He was a complete yogi in the real sense of the word. By watching all his actions the main thing I learned is to live every moment of life with awareness. He used to see when my mind was flying away and he would always help bring me back to the present moment. Awareness is not something that you learn just by doing yoga techniques in a class. It requires constantly living life with your eyes open, learning from each and every experience that comes. Hence, I learned from him that life is not only what we experience in this physical body, but that life is endless in its breadth and depth. I continue learning from him wherever I am, because my experience is that his spirit is alive, reminding me how to move through life. Another important thing I learned from him while being in his presence was selflessness – giving and dedicating life to others, to the service of humanity instead of being stuck in my small aims and mental trips. He has given my life a purpose and filled it with meaning. 2. You are a Swami and at the same time you have a family and run a Yoga centre. How do you bring spirituality and material life together? Spirituality does not take you away from material life. To have a family or to do whatever you have to do in life should not be categorised as materialistic, because it is not about what you do, but about how you do it. Swamis are not religious people, nor do they necessarily live in solitude inside a cave. They are people who develop tremendous awareness and a sense of non-attachment to external life even whilst living fully in the world. If we reject the world we will never be able to understand life. Rather, by fully accepting and experiencing it with awareness we can use it as a tool to gradually move beyond our limitations. “Be like the shadow that passes through water and doesn’t get wet, that passes through fire and doesn’t get burned”. This is the essence of a swami in modern times. 3. How can Yoga help the “modern man”? First we have to see how the modern man [or woman] is living. Typically, people in today’s society live a fast-paced, ambitious life, with a constant fear of not achieving. As a result of the stresses there is tremendous conflict, both internally and externally, that produce unhappiness and psycho-somatic diseases. Yoga is the science of improving the quality of life, from imbalance to balance, from stress to relaxation, from meaningless-ness to meaningful-ness. Yoga is the science that makes us aware of a wider aspect of existence, with a sophisticated system for counteracting the effects of this inadequate lifestyle modern human beings have created. Swami Muktidharma is offering workshops at Hemma May 10-12, 2013. It will be his first stop on his annual world tour.